Bob Wright, founder and head of the Oak Bay Marine Group and philanthropist, has died at age 82. Wright, who suffered from heart problems in the past, went into Royal Jubilee Hospital Wednesday and passed away shortly after 6 p.m. His wife, Yun Kloihofer was with him. He was working at his Oak Bay Marina office on Beach Drive until a few days ago, arriving at 10 a.m. and staying at his desk until 6 p.m., said Susan Barcham, company director of business administration. “This company was his heart and soul. It was what he did. It was what he knew. I knew he wasn’t the type to retire,” Barcham said. After nearly dying because of heart issues in the early 2000s, Wright dubbed himself the “Teflon man,” she said. The Oak Bay Marine Group has 300 year-round employees, with numbers climbing to 900 during peak season. Wright’s beloved Cape Santa Maria Beach Resort in the Bahamas, where he loved spending time, has about 50 more staff, she said. Company holdings include the Painter’s Lodge in Campbell River, April Point Resort and Spa and the April Point Marina on Quadra Island, and the Canadian Princess Resort at Ucluelet, the Oak Bay Marina on Beach Drive, Pedder Bay RV Resort and Marina in Metchosin, the North Saanich Marina, and Ladysmith Marina. Wright owned the Pacific Undersea Gardens in Victoria Harbour, the Oregon Undersea Gardens, Ripley’s Believe It or Not, and the Wax Works, all in Newport, Oregon. Wright used to have performing killer whales at his marina, garnering controversy as society changed its views about whether these animals should be in captivity. Barcham remembered when he sent the last whale to another aquarium, moving it on a busy election night to avoid attention. Personal trainer Rick Fayad knew Wright for 25 years. “I trained him off and on for years and we became friends.” The two would walk along the Oak Bay waterfront from Wright’s nearby waterfront Beach Drive house to Wright’s Oak Bay Marina where they would have coffee. In the early 2000s, Wright cut back on his working hours – to about 45 a week from 70 – after nearly dying because of heart problems. In 2007, Wright, who called himself a “gumboot fisherman” donated $11 million to UVic to create the Bob Wright Centre – Ocean, Earth and Atmospheric Sciences. 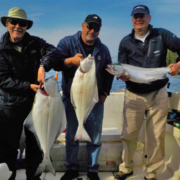 Regina-born Wright carved a business empire out of the sports fishing business, setting up resorts lodges along B.C.’s coast. Over the years, he did battle many times with the federal Department and Fisheries and Oceans over how to manage salmon fisheries. He also served as a member of Victoria city council. Wright was raised in Edmonton, starting in newspapers in 1946 at 16 years old. He moved to Victoria at age 18 to work for the Victoria Times. He was a strong-minded, colourful individual with a larger than life personality. Wright was a dedicated businessman, joking for many years that he would try to cut down on his workload and habit of carrying three briefcases to his office. Wright was married two times previously and had three children.